← Is it or isn’t it? Sometimes it takes a little nudge to get us out of our ruts. I’m currently traveling in the southwest with a bunch of canvases and paints. They say that travel is good for the soul. All I can add is that it makes me see the world with new eyes. I love the colors, the vistas, the entire flavor of this part of the world. This is a photo taken as I was perched on the edge of the Grand Canyon. I also spent several days painting the red rocks of Sedona. Now I’m in Santa Fe. I’ve discovered that it’s best not to look at the work of too many other artists as I lose focus on my own vision. I brought 19 canvases and intend to return with 19 paintings. Of more or less achievement. Stay tuned. 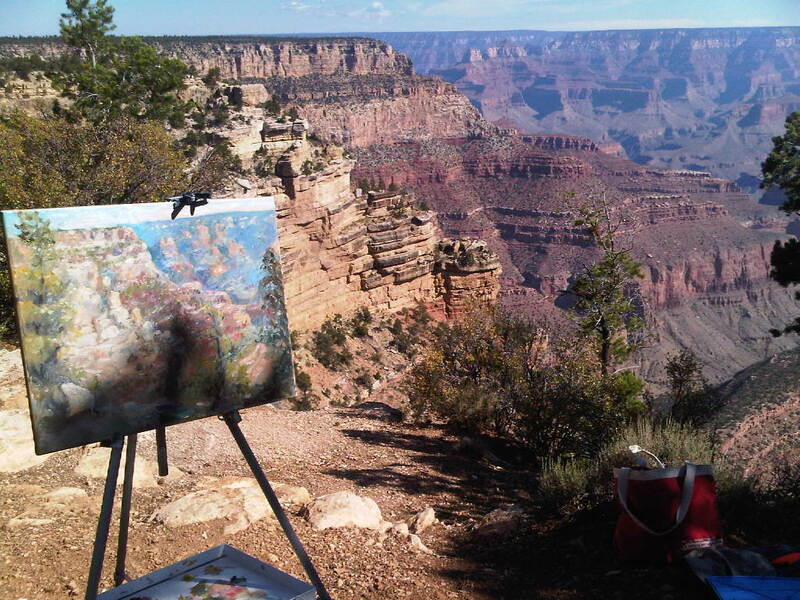 This entry was posted in Uncategorized and tagged art, grand canyon, kit miracle, oil painting, plein air, sedona, southwest. Bookmark the permalink. You do lovely work. I found the desert southwest and fell in love with it. I was foolish enough to leave it for a better more secure job. So ever since, I’ve been trying to get back. To me it’s no wonder that you’ve found the beauty in the setting. Thank you for your kind comments. The scenery is truly inspiring. I have found that when I’ve returned from other travels, I look at my own home area in a new way. Fantastic! I love it. Can’t wait to see the results. Something I hope to be able to do one day myself. Been doing mostly local plein air, and its exhilarating, I can’t get enough.